Having stared at all of the displays for what seems like an eternity, trying to determine which one has the best image quality, you think you’ve finally make up your mind and walk over to a store representative. You tell him you came in looking for a new Hi-Def TV, and that you’ve made up your mind; you want that brand new 55″ Plasma from Samsung next to the Sony. Upon hearing this, the representative musters the most horribly insincere smile you’ve ever seen, as he tries to decide how gullible you are. A second later, he turns, walks a few feet and stares at the rack in front of him. “Sir, if you want the best out of your expensive new TV, I recommend that get these cables,” he says, holding up a $150 HDMI cable from Monster. “And of course, you’ll also need a few of those if you want to get the best image quality out of your DVD player, sir” he continues, pointing at a set of $90 component cables, also from Monster. At this point, the representative should be talking to himself, while you’re a few aisles down looking at the far better value. 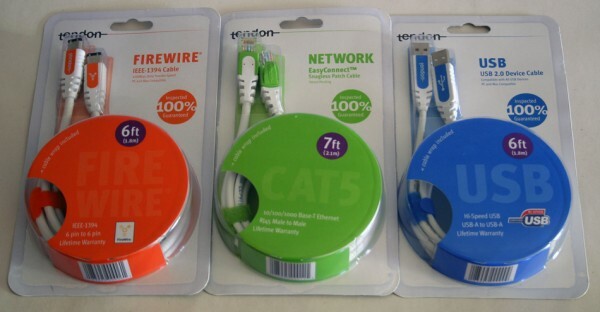 A quality alternative which gives the same bang for less bucks is Tendon cables. Tendon offers practically every cable imaginable: everything from computer cables to home theater cables. Every cable is made from high-grade materials and is manufactured in full compliance with the latest standards. On top of that, each cable is individually tested, and comes with a life-time warranty to assure customers that they are paying for a quality product that the company stands behind. Now, if you’d only read this paragraphs, you might be tempted to think that these cables come from the same price league as Monster’s cables. Fortunately, they’re not, and that’s what makes these appealing. If you do a little online bargain-hunting, it’s not too hard to find any computer cable from Tendon for well under $20, sometimes even under $10. For that price, you get a product that is not only well designed, but also feels like it can really take a beating. The connectors on either side of the cables are appropriately large, well fastened, and color-coded. Each cable type has its own unique color, making it pretty easy to know at a glance if you’re dealing with, say, a USB cable or a FireWire cable. Each computer cable also comes with a matching Velcro cable wrap. The Ethernet cable, as well as the HDMI cable, has gold plated connectors to ensure the best transfer. Store representatives love telling customers that if they want the best image quality, they need those expensive Monster cables. And to help you in case you’re a little hesitant, they’ve made sure that the only cables even remotely close to the home theater section are those over-priced Monster cables. They know that if you just spent several thousand dollars on a new flat panel or on some high-end speakers, you’ll be more willing to spend a few hundred dollars on cables. And the more the cables cost, the more money the store makes. It’s just that simple. The truth is, however, that for most applications a $12 Tendon HDMI cable will perform just as well as that $150 Monster cable. I’m not saying that those Monster cables aren’t worth it, but unless you have a reference quality home theater system, (something that would equal the cost of your car, if not your home) you’re not going to notice the difference. For short runs in general you’re not going to see any noticeable increases in performance by using a super expensive cable. And as long as the connection between the two devices is digital, signal degradation should be even less of a problem, since all that the cable has to successfully transmit is either a 1 or a 0, unlike analog connections. So, if you have to cover a short distance between two digital devices, do yourself a favor and check out Tendon cables. 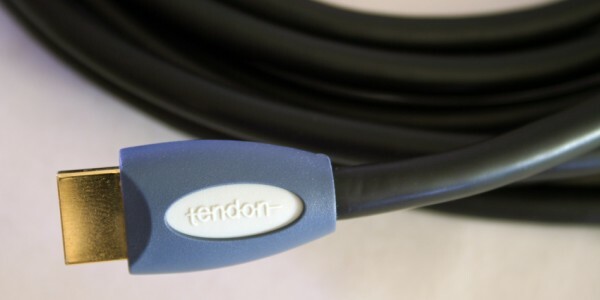 In short, if you need quality cables and don’t feel like being ripped off by Best Buy or Circuit City, we seriously recommend that you check out Tendon. Also as a bonus, Tendon has offered Skatter Tech readers a 20% discount on their next purchase. Just use the code ‘CPLgamer07’ during check out!